A couple weekends ago we traveled down to Salem, MA and went to the Peabody Essex Museum. I’d never been inside, but a little less than two years ago we were in town for a variety of activities (ghost tours, boat tours, house tours!) and we walked past the museum a few times. I’ve wanted to visit since then. Sarah and I met up with my parents at the museum. We had few expectations. We just wanted to see what was inside. While buying tickets for general admission, the Yin Yu Tang Chinese House, and several local colonial house tours our admissions man found out that there were no more tickets for the house tour he’d promised us. He felt bad for misleading us, even though it was no setback, and he gave us all free tickets for Yin Yu Tang. We hustled over there to catch the next tour. Yin Yu Tang is an 18th century Chinese house that was imported bit-by-bit to Salem and reconstructed at the Peabody Essex. It is breath-taking. Now I know superlatives and exclamations are overused, but not when applied to this house. This is a building heavy with history from a culture I have little experience with. I stepped through the front door into the courtyard and it was impossible to know Salem was outside. It was total immersion. I listened to all the stops on the audio tour. Even if we had seen nothing else that day, Yin Yu Tang was worth the trip. 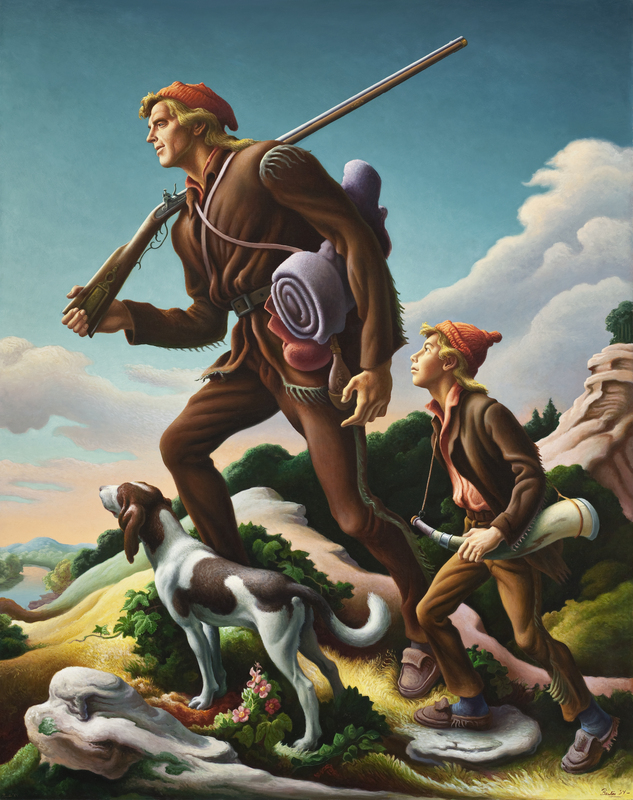 Benton was strongly connected to Hollywood, producing posters for many films throughout his life. He also created many pieces of anti-Axis propaganda during WWII. He liked social commentary for sure. It’s hard to see how visceral and strong his style is from these photos. From his first paintings I knew I’d found a new inspiration. His figures just pop. They’re muscular and sculptural. Comparing his paintings to the photos I’m reminded of my first time seeing van Gogh’s work in person. Five or six years ago I went to the Museum of Fine Arts in Boston and was really overcome by his paintings. The posters I’d seen in art class didn’t hold up to the real thing. There’s so much life in every van Gogh brushstroke. 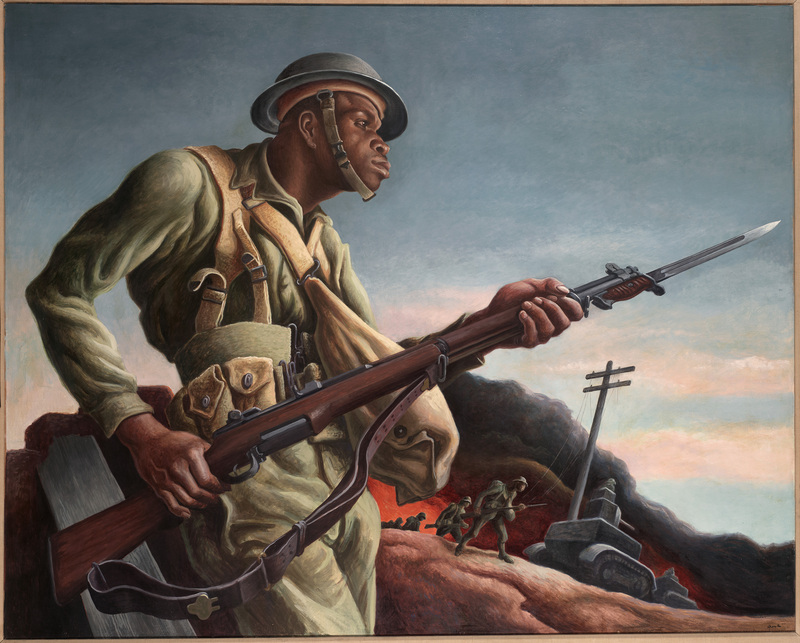 While not done with as much impasto as van Gogh’s, Benton’s brushwork evokes the same sort of feelings. I’ve been thinking about Benton off and on and the power of his figures. 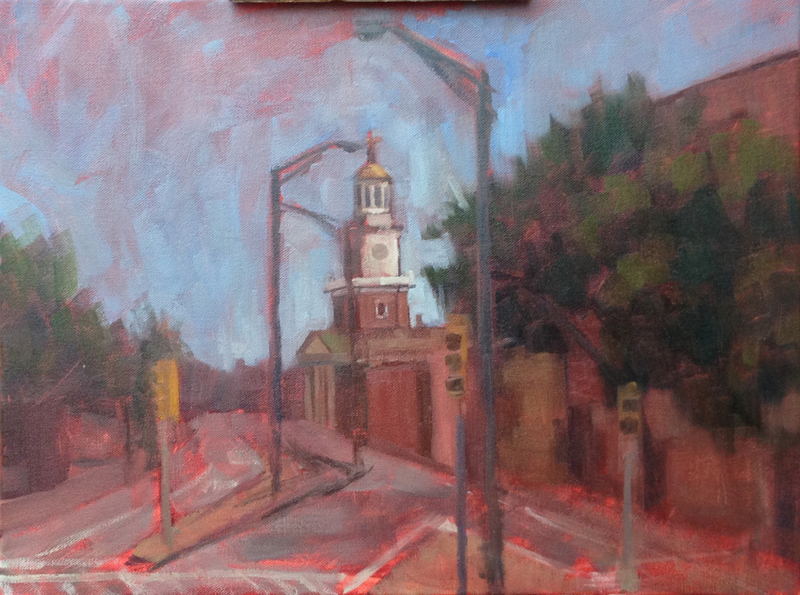 And perhaps subconsciously that came into play when I chose a subject for my plein air painting this Wednesday. 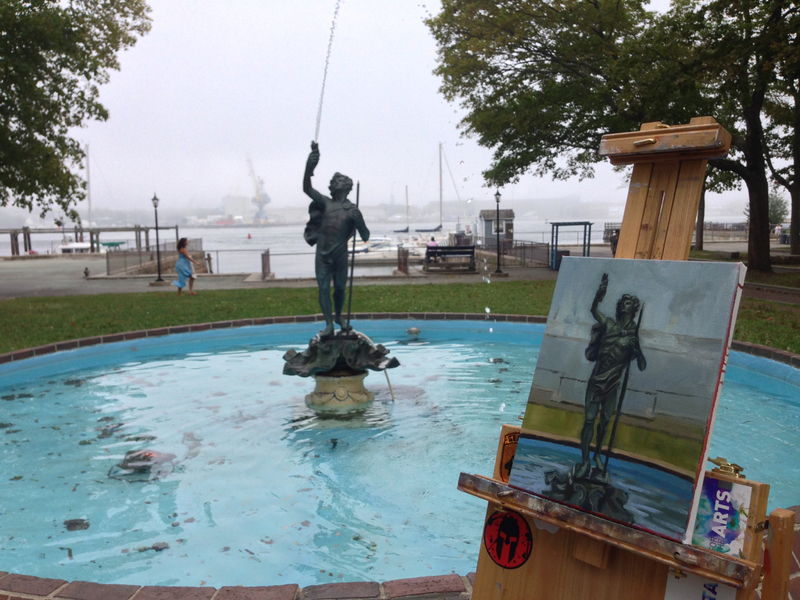 I went to Prescott Park to meet with the NH Art Association, though I didn’t see most of the other painters as they were on the other side of the park in the gardens. I was posted up in front of the Charles Hovey Fountain, which depicts a young Neptune catching a fish. I was umbrella-less that day, having accidentally left it at home, and when the sun peeked over the trees I had to end the session. I couldn’t see the canvas and my neck was melting. When I came back on Thursday the park was covered in a dense fog. This changed the lighting slightly, but surprisingly not too much. Though the highlights were not as strong on the figure I could exaggerate them in my painting to match the previous day. My favorite part of working on this painting was the pedestal. 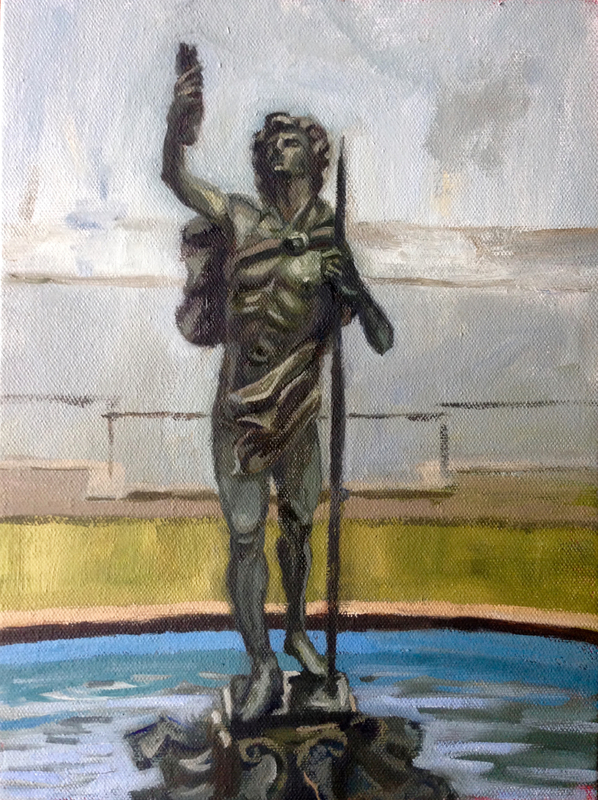 On the first day I had painted everything below Neptune that dark green color When I finally worked on the pedestal on the second day I simply cut out its shape by painting the water lighter around it. Then I added a few shadows and highlights. It left the pedestal loose and impressionistic. I wish I could’ve spent more time working on the background. I was held back. After two paint throughs of Neptune I realized I’d made his head too big and that was throwing the perspective off. I had to chop his head almost in half and repaint the whole face. That was a bit of work. While I was working I talked to a man who told me the rod Neptune holds is a trident and that the triple-pronged end was stolen several times.They kept replacing it until they submitted to the thieves and just left it off. 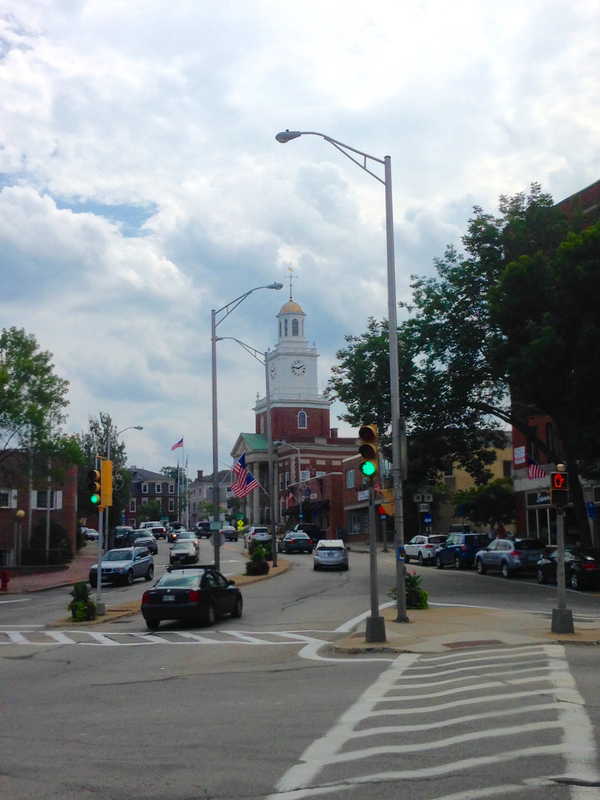 On the first day, Wednesday, I was walking back to my car when I caught a good view of an old colonial on Court St. 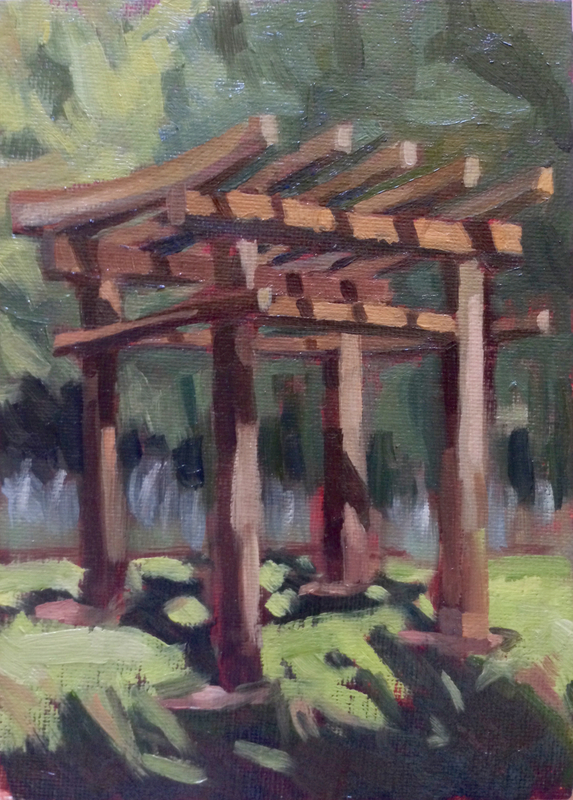 I set up in the shade of a tree and hashed out a quick 5″ x 7″. Two thirds of the way through the painting I met a nice woman who expressed a great interest in the piece. We agreed on a price and exchanged info. I delivered it the next day! I almost forgot to snap a photo before I delivered the piece. This one was a little rushed and doesn’t show the depth of the yellow on the right. I enjoy painting 5″ x 7″s a great deal and I’m contemplating building a body of fifty or so of them and then renting a booth at a large art or craft show. A short ride from my apartment is the expansive and unique Bedrock Gardens. 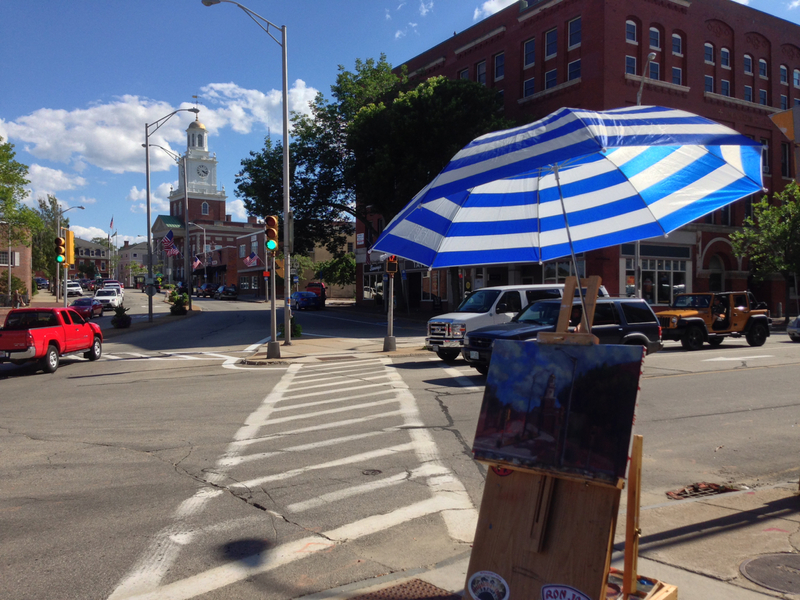 I met several artists from the NH Art Association there for a plein air session. For the first thirty minutes I walked around searching for a subject. There was just too much to see. To avoid becoming overwhelmed I finally just picked a subject and went with it. This trestle was standing in the center of a long stretch of grass lined by two parallel rows of young trees. I imagine that in ten years time, once the trees have grown, the trestle will sit at the end of a beautiful, tall, and leafy alley. There was a lot of information to squeeze into my tiny 5″ x 7″ canvas panel. For twenty minutes I wrestled with the perspective drawing until I got the trestle constrained. I knew if I didn’t contain it at the beginning that it would only get harder to work with. I hit my rhythm early on with this painting and had it done by noon. Everything seemed to fall into place. Trestle is for sale at $70. If you’d like to purchase this painting, please send me an email at thewritingmann@gmail.com. Last week I began an ambitious painting on a 12″ x 16″ canvas. I wanted to commit myself to a multi-day piece. 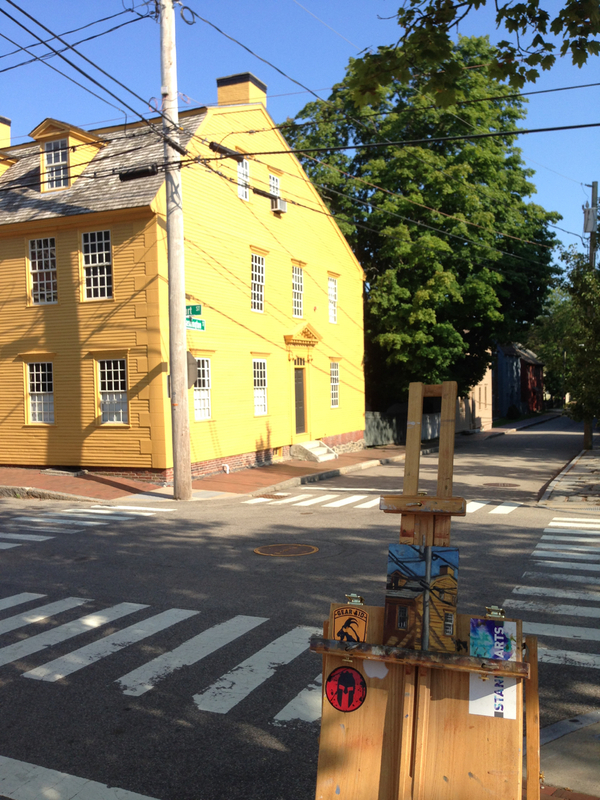 My time spent in Portsmouth and Kittery made me want to paint major scenes from several seacoast towns. Since Dover is right down the road, I went there first. Dunno why I didn’t just stay here in Newmarket. Due to morning errands, I had to start in the afternoon. I puttered into Dover around one and walked around for half an hour looking for a spot. 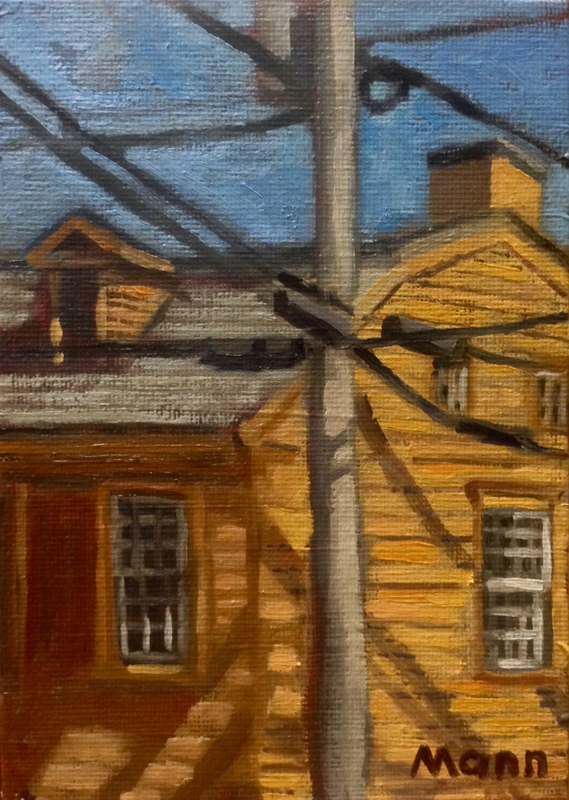 Originally I had wanted to paint the mills and the Cocheco River, but I couldn’t settle on a view I enjoyed. Lugging my easel a couple blocks north I found something that would work. Standing beneath the awning of the Thirsty Moose I had a direct view of town hall. It was overcast the first day and very cloudy. 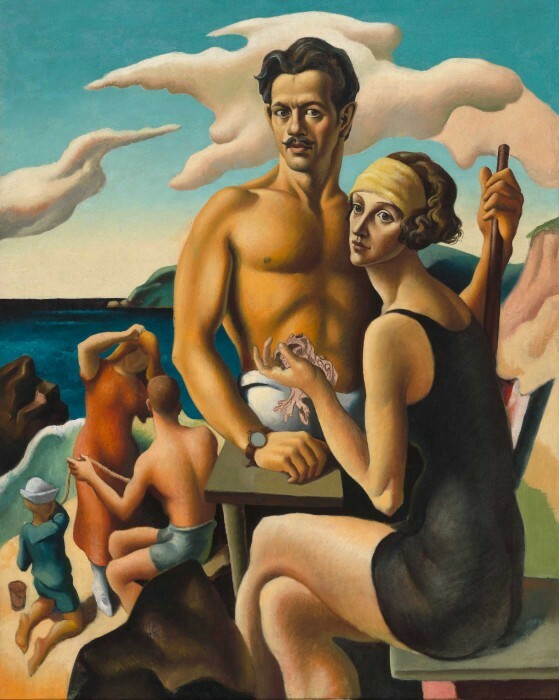 The painting was a concentrated labor. I tried to stay positive knowing that the clouds would eventually move and the sun would give me some fun shadows and lights to play with. When the clouds did move I found my spot was incredibly hot. I put up the umbrella, but that didn’t mitigate the heat that rose up from the pavement. Additionally, I was standing at the middle of what was essentially a wind tunnel crossing. 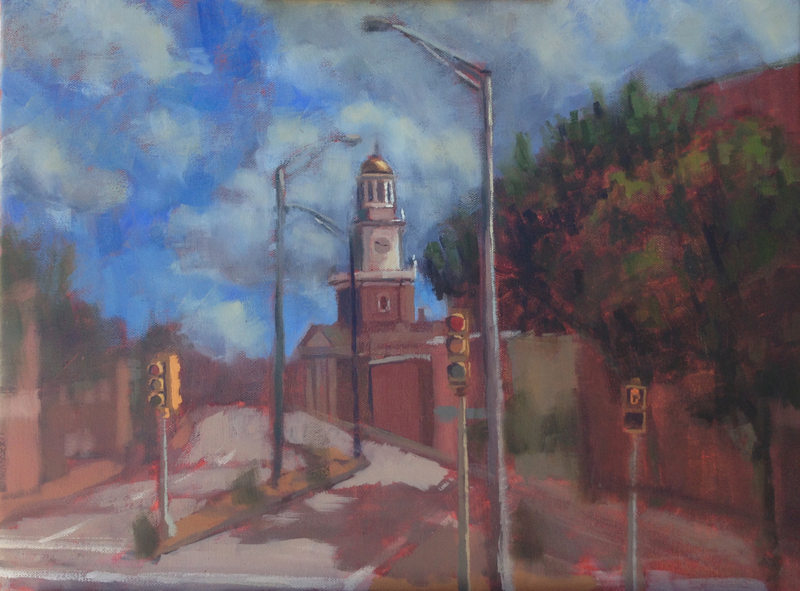 The streets behind me and to my right were lined with multi-storied buildings that funneled the air violently straight down, causing my easel to shake and rattle and in one instance fly up into my chest. I weighed it down after that with my bag of paints and luckily the worst of the winds were only on that first day. The canvas was still wet from some last minute toning when I began. This caused some of the colors to muddy as the color I mixed on my palette smeared together with the burnt umber background. Day one involved a lot of perspective work. Once I had the trees, light posts, roads, and buildings in their general positions I hammered in the lights and shadows. 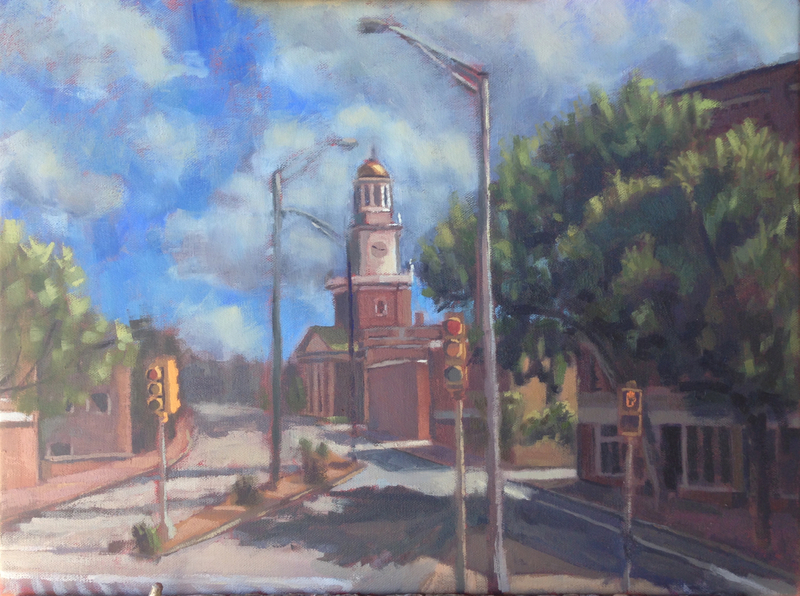 Part of this process involved developing the background and rendering clouds. I needed the lights in the sky figured out so I could use them as reference and compare them to the lights in the foreground. At first the clouds were much bolder, blocky, and meaty. That style pulled them too far forward. I scraped them down and it gave them a necessary softness. With the painting mostly finished I focused fully on color. I had pushed the shadows too red previously and needed to bring them back to the cool side. I’ve been watching a lot of James Gurney‘s videos on YouTube and taking notes on how he works en plein air. In his video on painting a taxidermic Galapagos tortoise he mentions how he paints the shadow under the tortoise blue in order to give it the appearance of being outdoors in natural sunlight. After watching that video I really began to see how blue shadows were outside. I tried to incorporate that into my painting. The painting took 5 days to complete with me working three to four hours each day. I met a lot of people on the street and handed out a good number of business cards. If you’re reading this cause you took a card, well thanks for stopping by and talking! I do enjoy it. I decided to call the painting finished after five days because it was beginning to feel that way, but also because I was beginning to tire of working in that spot. Honestly, I still think the perspective could use some work. I’m not sold on the depth in the painting. I’ve always struggled with that factor. Probably because I’ve mostly only painted in the studio. I remember being in Italy and painting and one of my professors explaining atmospheric perspective to me and just not having it click in my head. Of course he showed me one of the grad student’s paintings, as she was situated right behind me and had a similar view, and I could definitely see how her painting looked better. I could see how she’d made the mountains blue in the distance. I just wasn’t sure of how to go about doing that. It’s something I’m still working on. I just don’t often get a chance to practice painting from a point that has clear and defined atmospheric perspective. I’ve climbed a lot of mountains in the last couple years, and when I get to the top I sit and look at the layers of mountains receding into the distance and think about how simple it is to see the atmospheric perspective now, and how simple it would be to paint those mountains. But depth and atmospheric perspective works a little different at ground level. It’s still there, just much more subtle. And I know that exaggerating that effect could give my paintings some nice depth. 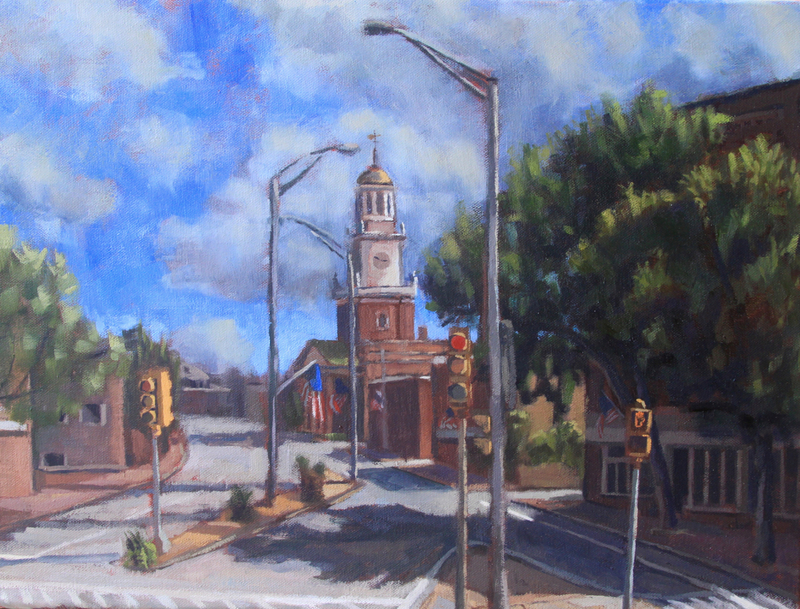 I tried it a bit with this painting, blurring the buildings in the background and painting them mostly blue. I’m just not sure how successful it is. I’m thinking of expanding my palette a bit. I’m using alizarin crimson, burnt sienna, raw sienna, gold ochre, cadmium orange, ultramarine blue, sap green, and a bit of cerulean blue. This limited palette has kept my paintings feeling unified, but I’ve noticed that painters on YouTube usually organize their palettes by having a warm and a cool version of each color. I might try this out and see what effect I get. If you’re interested in purchasing Dover Crossroads, it’s for sale at the low, low price of $325. What a steal! Get it now! There’s a limited supply of only one! Hurry! Send me an email with your order to thewritingmann@gmail.com! This past weekend Sarah and I went to Webster, New Hampshire and stayed at a cabin for a night. Her aunt and uncle had rented a place on Lake Winnepocket and invited us up. It was a cute town on a nice, quiet lake. We got there around 8 on Friday night and spent a few hours playing games and sitting by the fire. In the morning I woke up to paint. The sun wasn’t above the tree line yet and it was hard to find a subject that wasn’t entirely in shadow. 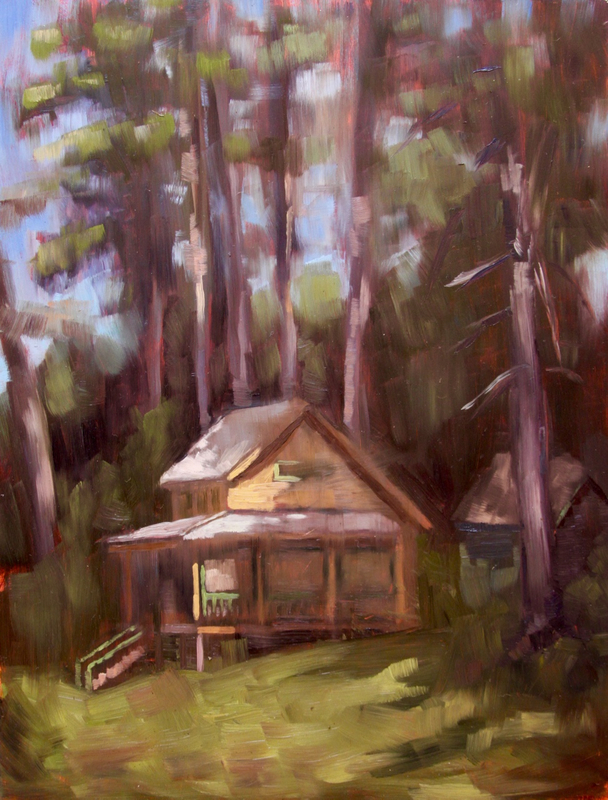 I decided to paint the neighbor’s cabin, knowing the direction the sun was heading and hoping I would get some interesting lighting. I worked for around an hour and realized there was some heavy cloud cover above. Everyone was up at that point and getting ready to check out the local flea market. I set the painting aside and joined them. Halfway through our excursion the sun burst through the clouds and the day took a positive turn. We got back to the cabin and I was able to work the painting to a point that I was satisfied. The lake was calling. It was time to go swimming. The lack of sun was tricky, but even worse I was also dealing with an ungessoed, smooth panel as my painting surface. I’m used to the texture of canvas. My brushes did not act as they normally do. I wanted to try the panel because I sometimes don’t like the repetitive woven texture that shows through cotton canvas paintings. The panel painting only began acting as I’d hoped after I’d painted several layers and I was starting to paint over semi-dried paint. I also noticed that my brush was much more likely to pull paint away from the panel. The tackiness of semi-dried paint played a much larger role on panel. Perhaps I’ll try linen or some sort other sort of smooth, woven canvas. Like this painting? Buy it for only $150! Email me at: thewritingmann@gmail.com!